Cynthia Ryan is the only female member of the Electric Auto Association of Northern Nevada, or EANN. She attends an event at the Nevada Automobile Museum. She's pictured here with her Nissan Leaf. Our series “Behind the Battery Boom,” explores how Tesla is shaping the local landscape. Here in Northern Nevada, a group of electric car enthusiasts is working to build a bigger fan base. Reno Public Radio’s Anh Gray spent time at one of their events to learn more. 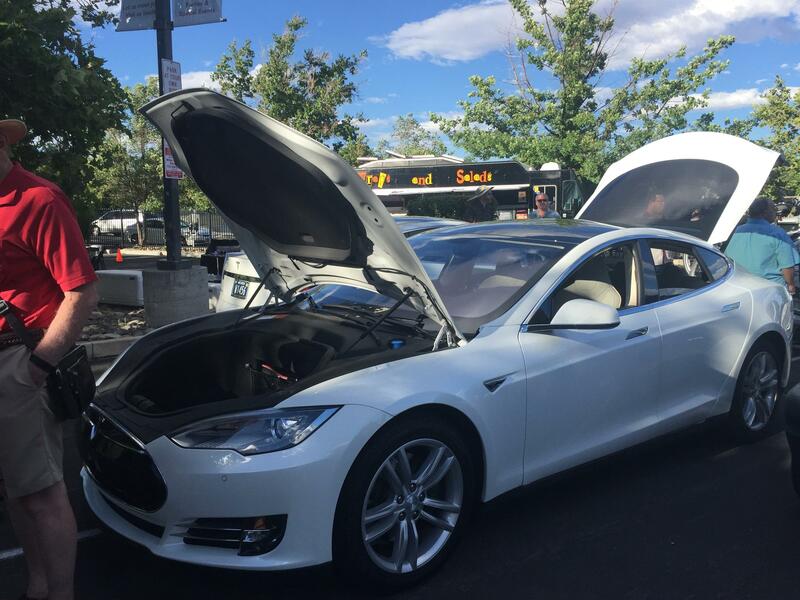 On a breezy summer afternoon in downtown Reno, a few dozen people are gathered for an event hosted by the Electric Auto Association of Northern Nevada, or EAANN, a group of electric vehicle, or EV, devotees. They’re in the parking lot of the National Automobile Museum, where Jay Hubbard is the Automotive Collections Manager. Onlookers are inspecting the old-fashioned 1914 Detroit Electric that’s on display next to a few of its contemporaries like a cherry red Nissan Leaf and a sleek, white Tesla. Hubbard is explaining how the antique car worked. He says EV technology has evolved since then. Hubbard is not surprised to see modern technology breathing new life into old concepts. 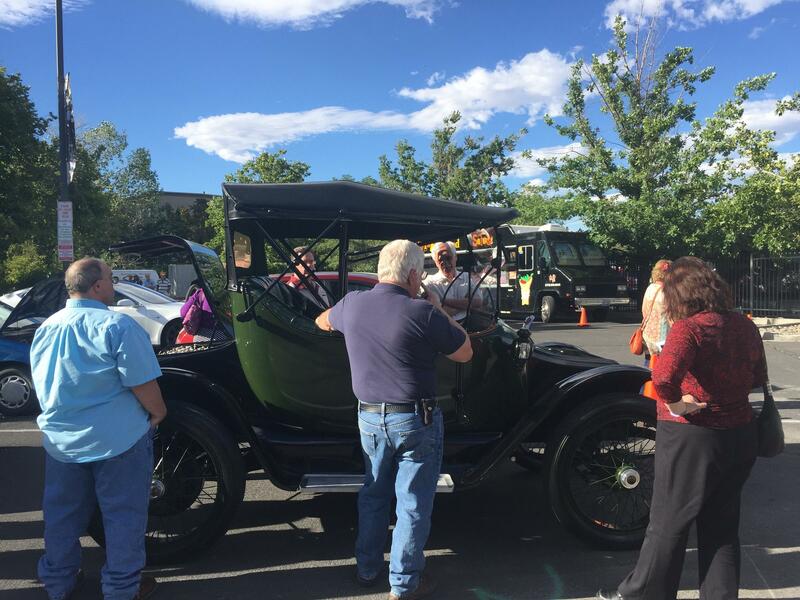 A group of people gathered around Automotive Collections Manager Jay Hubbard to hear him talk about the features of the 1914 Detroit Electric. Chuck Swackhammer is chairman of EAANN and his motivation for driving an EV is to reduce his carbon footprint. For Swackhammer, driving EVs makes sense for his lifestyle since he likes to stay close to home. A black and white hearse parked at the museum belongs to hacker-maker William Brinsmead; he cares about the environment but he also enjoys the fun of converting cars. Brimsmead converted his 1973 Cadillac hearse to electric and still remembers going to the DMV to get his plates. Brimsmead has been a fan of electric cars since he built his first hybrid in the ‘70s while overseas in the military. 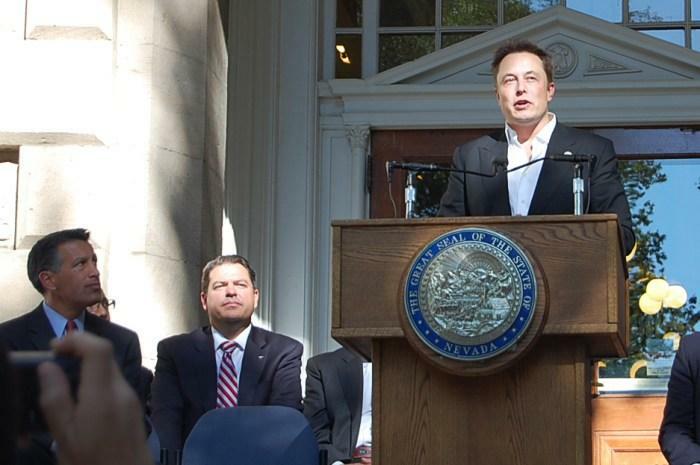 He says it’s been exciting to see how Tesla has shaken up the EV industry. 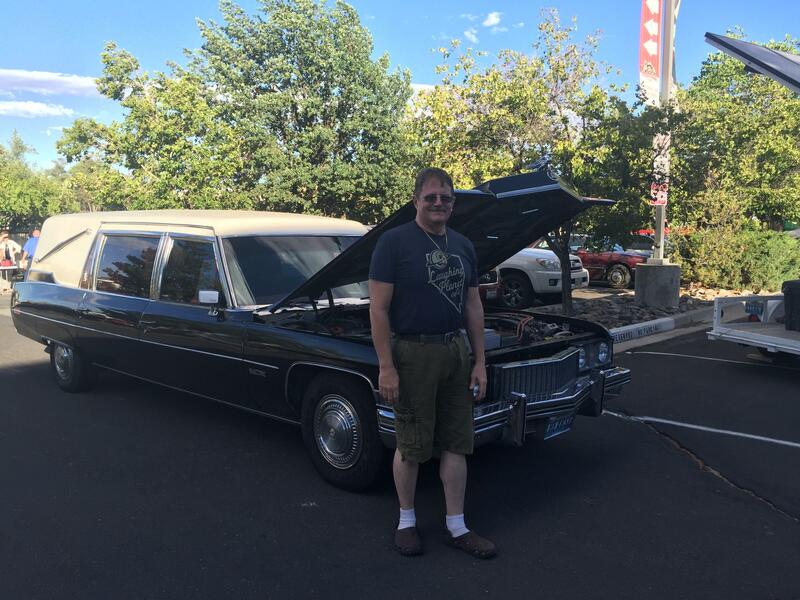 William Brimsmead converted a 1973 Cadillac Hearse to electric. Also part of the group is Cynthia Ryan, who’s the only female member. She’s a relative newbie and has been behind the wheel of a Nissan Leaf for about two years. Ryan says the EV community is at a tipping point. A Tesla owner displays car at National Automobile Museum. Ryan would like to see the public more interested in electric cars. And with Tesla’s Gigafactory in Reno’s backyard, Ryan says she’s disappointed the company hasn’t taken a more active role in the community. For now, Ryan and other EV fans remain a small niche market. Attention to the industry has definitely heightened since Tesla came on the scene with its vamped up technology and futuristic designs. But, what many people are waiting to see is whether the next generation of electric cars will gain enough traction in the years to come. Tesla Motors unveiled its new mid-luxury electric car at an event in Los Angeles Thursday night. Dubbed the Model 3, the starting price tag is $35,000, or about half the cost of the company’s previous models. Nevada’s prehistoric lakebeds are more than just picturesque, they’re the site of a lithium rush taking place on public lands. This quest for alkali riches has been fueled by a surge in worldwide demand for batteries. For more than a century, prospectors have searched for lucrative minerals across the American West under the Mining Act of 1872. That law allows them to stake a claim on a piece of ground and whatever minerals may be hidden beneath. 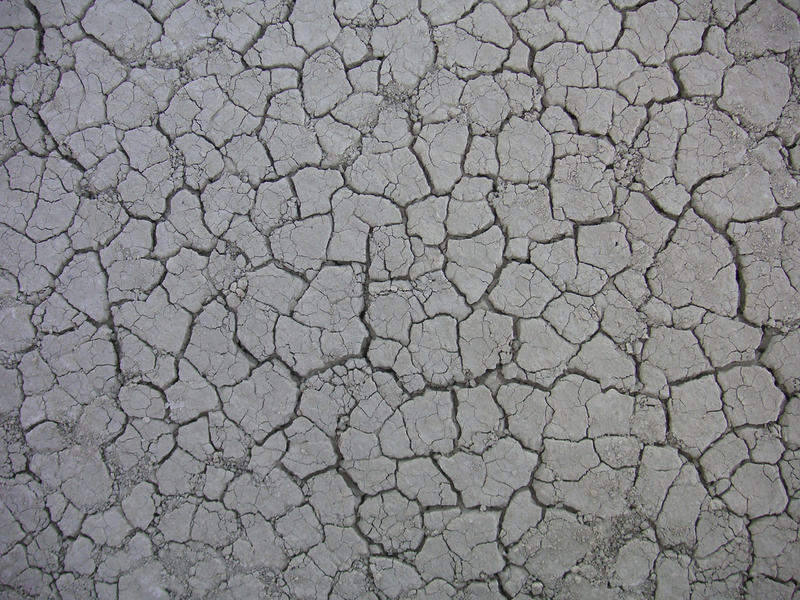 Lately, in Nevada at least, the area drawing the most interest are its salty, ancient lakebeds.